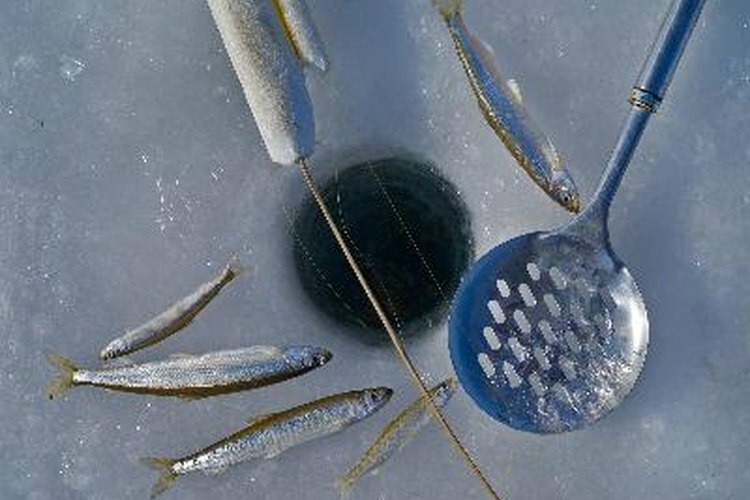 Underwater ice fishing cameras are sold with a monitor for avid ice fisherman, so they can watch their bait and see what types of fish are interested in it. However, you can make your own ice fishing video camera with the right types of equipment and cover for your electronics. Encase your video camera in a waterproof box of plastic which is sealed air tight, so that there is no way any water can actually leak into the electronics. Drill a hole in the top of the box, big enough for your plastic tubing to run into. This is where your cords connecting your camera and your monitor and the surface will run. Around the area where the plastic tubing meets the plastic box, plastic should be firmly melted around the tubing, to seal it from any water leaking through. This should be done after the wires have been run through it, of course. Inside the plastic box, silicone putty and heavy duty tape should also be added around the hole, to really ensure no water can get into the box and damage the camera. Weight the bottom of the box so it has no trouble sinking, even though it is dry on the inside and attach a couple ropes or chains to the outside of the box to raise and lower it with. You should never raise and lower it by the plastic tubing, as this may cause it to tear, create a leak and ruin your camera. As you'll want to see what the camera is seeing underwater the whole time, hook your RCA cables up to your monitor from the camera, making sure they are the proper length to go from where the camera is in the box underwater all the way up to where the monitor is in the ice fishing shack. To power your television monitor, buy a generator which can run off gas to sit in the ice fishing shack with you, though you might already have something like this to give you electricity for light. The underwater ice fishing camera will need a bit of maintenance as water will break down homemade underwater containers rather quickly. Make sure the seal between the plastic tubing and top of the case is in good shape each time you pull the camera up. It would also be a good idea to figure out how to run direct power to the camera itself so you're not having to replace the battery every one to two hours. Most cameras have direct power inputs that will run off electricity from an outlet. This means you will probably have to run extension cords up through your plastic tubing to your generator to make this happen, meaning your tubing will have to be a big larger in girth.